The icon I'm talking about is the one on the panel that looks like a gear. Its menu includes a power button, Shut down, Suspend, Logout and all that. It's the default icon and to be perfectly frank... I absolutely hate it, but I can't change it without messing with the entire panel (Ubuntu-Mono-dark which I LOVE). How can you change that icon, and that icon only? ...to make a matching set in case there would be a change in state for some reason. Not the answer you're looking for? Browse other questions tagged icons panel icon-themes or ask your own question. 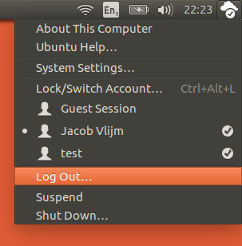 Remove online status menu, but keep the logout menu? How do I change the volume control icon?